https://matcha-jp.com/en/1448 Have Your First Ramen At Ichiran, The Top Ramen Shop In Asakusa! The popular tonkotsu pork broth ramen shop, Ichiran, located in Asakusa, is our recommendation to everyone visiting Asakusa and wishing to taste authentic ramen dishes. When touring around Tokyo and visiting Asakusa for the first time, most visitors are likely to stop by Sensoji Temple and the Kaminarimon Gate. Sensoji Temple is the iconic landmark of Asakusa and its colorful structure and traditional feeling brings many tourists to this very spot. Going to Sensoji Temple does take a while and if you journey around all the facilities related to Sensoji Temple, you will need about an hour to see it all. If you indulge in all the spots around Sensoji Temple, time will fly by quickly and you will easily get hungry. A great place to stop by at a time like this is the popular tonkotsu ramen shop, Ichiran, that opened in December of 2015 right by Sensoji Temple. We would like to introduce you to the basics of the popular tonkotsu ramen shop, Ichiran Asakusa branch. What is Ichiran Asakusa Branch? After walking about a minute from the Asakusa Station on the Tokyo Metro Ginza Line or Tobu SKYTREE line, you will find the Ichiran Asakusa branch. The store is famous for its "counter seats that help you focus on the flavor" and for the Ichiran Yatai, the first yatai that was made in the Kanto area. Before explaining what Ichiran Yatai is, let us first explain what a "yatai" is. A yatai is a traditional portable shop on wheels with a roof and many can be found in the Nakasu area of Fukuoka prefecture. At the yatai shops of Fukuoka, the locals and visitors can enjoy meals casually. At Ichiran Yatai, they brought the essence of the yatai from Nakasu and applied it in the shop to show the people of Japan and the world what the yatai culture is like in Fukuoka. Draft beer can be found in most Ichiran shops, but at "Ichiran Yatai", they also serve other alcoholic drinks such as beer in glass bottles and sliced lemon chuhai. Here, you will be able to enjoy the yatai atmosphere along with the retro feel of the Showa period. At Ichiran, there are partitioned counter seats. This type of seats are original to Ichiran and they make it possible for customers to focus on the flavor of the ramen without getting distracted by the people around. The photo above shows the Natural Tonkotsu Ramen (Original Since Opening Day). The aromatic tonkotsu pork broth soup matches well with Ichiran's special noodles as the deep flavor is enhanced by a secret sauce made with chili peppers and a blend of over 30 different ingredients. A bowl costs 790 yen (with tax). This photo shows the Grilled Pork in Aged Sauce Dish. This is the popular chashu pork, which is usually used as a topping for the tonkotsu ramen, served on its own. This delicious side dish can only be found in the Tenjin Nishi Street branch in Fukuoka for 490 yen (with tax). Here, we have the Matcha Green Tea Almond Tofu. The pleasant sweetness and a soothing aftertaste of the almond tofu match well with the rich flavor of the matcha green tea sauce. This decadent dessert is 390 Yen (with tax). When ordering ramen at Ichiran, you first buy a meal ticket at the vending machine. The machine has labels written in other languages aside from Japanese along with helpful multi-lingual menus to help you pick what you like. You can always look at the menu for additional orders as well. To find out how to order ramen at Ichiran, please read "Authentic Tonkotsu Ramen Loved by the World at Ramen Shop, "Ichiran". Did this make you want to get a bowl of ramen at Ichiran? The Asakusa branch has the most seats within the Tokyo area (as of December 2015), so for those craving some ramen while touring around Asakusa with your friends and family, this may be the perfect place to stop by. 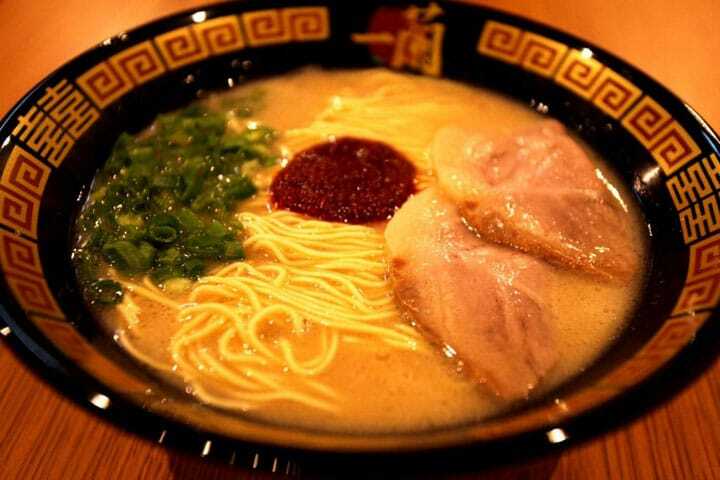 Why not indulge in a delicious bowl of ramen that even the locals love, right in Asakusa?